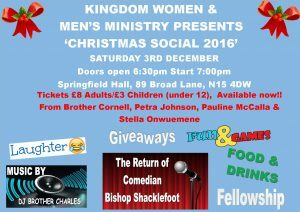 As we come to the end of another year, we would like to invite you to come and fellowship with us at PCF’s Christmas social. All are welcome so bring your children too. Tickets are available from Sunday 13th November. Contact Connell Walden, Petra Johnson, Pauline McCalla or Stella Onwuemene for tickets. You can also contact Vernetta Lynch for more information.